In an April 2 column, Chip Johnson of The San Francisco Chronicle wrote about the closing of the Nummi automotive plant in Fremont, a 28-year joint venture by General Motors and Toyota. A headline on the column, however, created some confusion. The column had nothing to do with the closure reviving memories of a flood in the Midwest although an unfortunate break between the two lines of the headline made it appear that way. The intended message? Nummi’s closure caused memories of a Midwestern plant’s closure to come flooding back to the columnist, who was affected by it. In other news, The Chronicle on April 3 reported that San Francisco Police Chief George Gascón made a formal apology to the Bay Area’s Muslim community for remarks he made a week earlier. The problem, The Chronicle noted, started with “comments he made to a 150 City Hall officials and members of the building trades regarding a June 8 seismic retrofit bond. “During that event, Gascón reportedly said that the Hall of Justice is susceptible to terrorist attack by members of the city’s Middle Eastern community, including an Oklahoma City-style explosion caused by a van parked out front. “Gascón [later] denied lumping Middle Easterners or Arab Americans together, saying he referred specifically to those from Yemen or Afghanistan as potential threats…. On April 2, Chief Gascón told a gathering of Muslims: “I’m sorry that I’ve offended you, that I’ve offended the Afghan community and other Middle Eastern communities.” His apology was warmly received. “I really respect him now,” said Iftekhar Hai, president of the United Muslims of America Interfaith Alliance, after the apology. Reading about all this, I too felt reassured about the police chief — until I had one of those Clark Kent/Superman flashes. 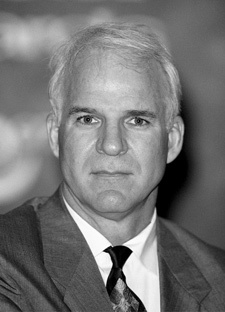 Has anyone ever seen Chief Gascón and comedian Steve Martin in the same room together? 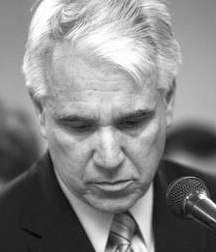 Is it possible the apology was merely a Steve Martin stunt? More from The Chronicle. 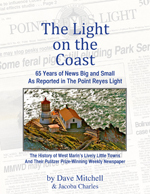 I hope you read Jon Carroll’s March 31 column, for it was set in Point Reyes Station. At dusk. With the evening growing cold. And Jon locked out of his car which was parked in front of the Tomales Bay Foods Building. It’s an engaging column, so if you haven’t read it already, you ought to take the time. Looking around West Marin, what else is in the air? 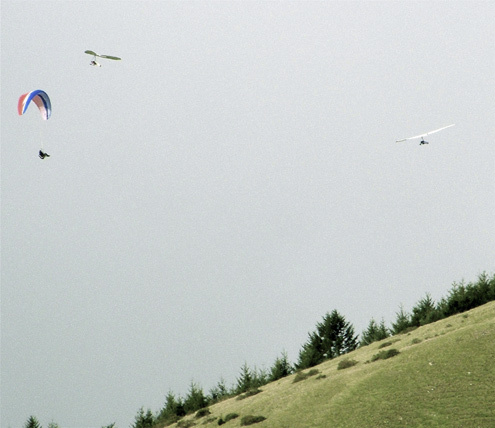 How ’bout these three hang gliders above Stinson Beach? 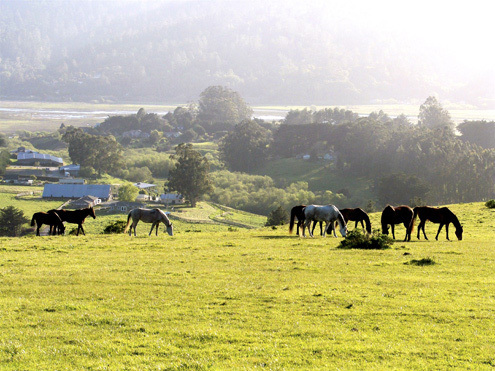 Or the Point Reyes Arabians herd atop the hill above my cabin? 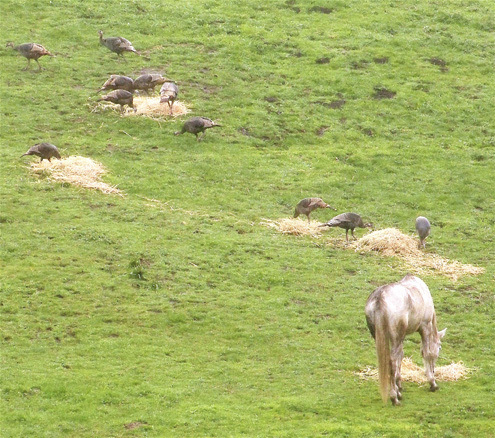 When hay is put out for the Arabians, the wild turkeys rush over faster than the horses, apparently because they like to eat mites that are found in the hay. Or so a stableman told me. Sparsely Sage and Timely is powered by	WordPress 4.9.10 and delivered to you in 0.663 seconds using 54 queries.